Add a RadThemeManager control to your form. Add the XML file containing the theme to your Microsoft Visual Studio project. 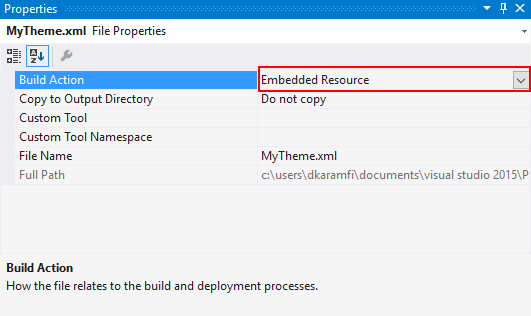 In the Properties window for the XML file, set the Build Action to Embedded Resource. Select the RadThemeManager control and open its Smart Tag menu. Select the Load Theme From Resources task. Enter your theme's name in the Load Theme dialog box, and then click OK. Using the same approach, load the theme repository file and all other theme files that you need. If the form with the theme manager will be opened multiple time in the life cycle of the application, the theme manager needs to be diposed explicitly. A suitable place to call its Dispose method is the Closing event of the form.